All of our kids’ ski groups are small and friendly. Our lessons are taught in English, by an experienced instructor. And all of our children’s lessons are based around fun and learning in a play environment. Your child will improve and build confidence without feeling like they’re stuck in ski school. Plus, we always try to finish on a high with a challenge or activity on the last day, such as a mountain-based treasure hunt or a trip to the fun park. Then, at the end of the week, each child will receive a certificate and badge in a presentation ceremony. We use the Snowlife awards system for our children’s ski groups, as recommended by BASI (British Association of Snowsports Instructors). Our children’s ski lessons run all season long in most resorts, although times and duration may vary, as detailed below. First and foremost we want to ensure that your children are safe during their time with us. All our groups have an experienced and friendly children’s instructor, often accompanied by a helper. All kids are required to wear helmets and bibs. And we check that they have everything they need from sun cream and protective eyewear to money for a snack stop. We also operate a secure sign out system to make extra sure that every child is handed over to their parent. Then we ensure we teach them to ski in a safe manner, on terrain that will stretch but not exceed their ability. We love skiing and being in the mountains, and we love to share our enthusiasm with your kids so they want to come back year after year. We realise the importance of a great first experience on skis for kids. Children learn differently from adults and so we put a high emphasis on games, challenge, and adventure so that they learn whilst having fun. This might involve activities such as a mountain-wide treasure hunt, trip to the fun park or mini Olympics. The week always finishes on a high, leaving your kids keen to return next year. Children’s ski lessons are an investment that we take very seriously. Behind the fun, we know that you want your kids to progress and develop into competent skiers. Each course has specific aims and goals to prepare them for the next stage and we keep a record of your child’s success to help their progression each year. Our carefully thought out pathway will help your child progress into a competent and confident skier. And they may soon give Mum and Dad a run for their money! Our children’s ski lessons are split into groups from tiny tots aged 4, right up to all-mountain teens aged 13. We know they get better than you quickly! So whether this is their first time on skis or their fiftieth we’ll help them improve and have fun in a sociable and supportive setting. Our youngest group, Whippersnappers runs for just 2hrs a day, as they tire easily at such a young age. Groups are limited to 6 children, with a helper when there are more than 3. This ensures they get plenty of individual attention. We have an optional upgrade to two full days of lessons for all but the youngest group. This means more ski time for you and your child. For lessons longer than 2hrs we will normally stop for a break so we suggest you give your child up to 6€ or 6CHF for a hot chocolate, and a snack in case they get hungry. We have a rigid signing in and out procedure for all of our kids’ group lessons, so please ensure you arrive at least 10 minutes early on the first day. All children skiing with us must wear a helmet for safety reasons. We have a wide range of kids’ groups running and base our groups on both age and experience. For more info on each group see our children’s level guide. 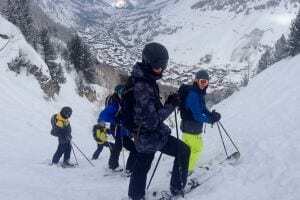 The following details apply to our group ski lessons in most resorts. If you’re looking for lessons in any of the following resorts, select the button below for more details. In Les Arcs and Vallandry our children’s groups above Whippers start at 9:15, run for 4.25hrs a day and cost 420€ for 5 days and 460€ for 6 days. If your children are keen to ski til last lifts then Ride Tribe could be just the ticket! After a supervised hot, sit-down meal for lunch, we’ll head back out for an afternoon of activities. As well as a full day of fun for your child, our Ride Tribe option offers you a full day’s skiing or a long leisurely lunch. Bombers, Rockets, and Freeride skiers can join Ride Tribe. It runs on Tues/Thurs, or Weds/Fri (resort dependent), and is a continuation of their group lesson, so they’ll finish at 16.30. The cost is a 150€ supplement to the price of their group and includes lunch on both days. 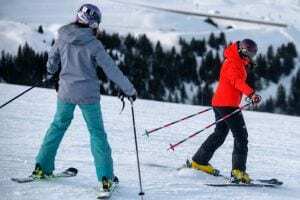 Not quite sure what level your child is at skiing? Or what group they’d flourish in? We know how important it is to ensure your child is in the right group for their level. Which is why we’ve created a complete set of handy children’s ski levels videos to help guide you. 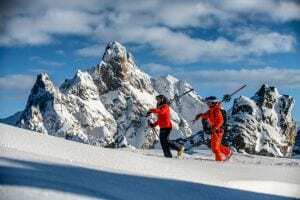 Have more questions about your child’s ski lessons? We’ve got answers. Check out our FAQ page for commonly asked questions about our kids ski lessons.